Place potatoes in 4-quart saucepan; add enough water to cover potatoes. Add 1 teaspoon salt. Heat to boiling; reduce heat. Simmer uncovered 20 to 30 minutes or until tender; drain. Mash with potato masher or electric mixer on low speed. While potatoes are cooking, melt butter in 1-quart saucepan over medium-low heat. Cook garlic in butter 3 to 4 minutes, stirring frequently and being careful not to brown butter, until garlic is very soft. Stir in milk and herbs. Cook until thoroughly heated. 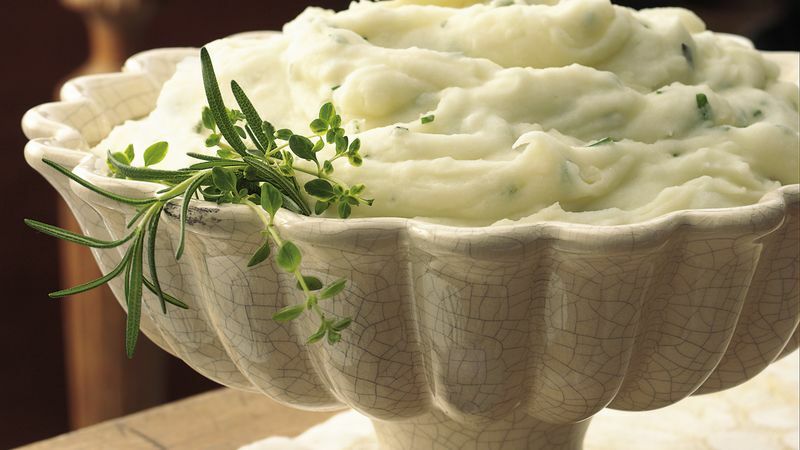 Add milk mixture to mashed potatoes; beat until smooth and creamy. Season with salt and pepper to taste. Mash potatoes with a hand masher, or if using an electric mixer, mix on low speed. Mixing on high speed can make the texture pasty. To avoid last-minute preparation, the mashed potatoes can be made up to 4 hours ahead and kept warm in a slow cooker set on Low. Spray the inside of the cooker with cooking spray before adding the potatoes. Russet potatoes are low in moisture and high in starch, making them good for baking and mashing.